The Vegan Outreach Blog: Help Raise $350,000 for Vegan Outreach: Team Vegan 2014! Help Raise $350,000 for Vegan Outreach: Team Vegan 2014! We have an unprecedented opportunity to continue to expand Vegan Outreach’s work - a number of generous donors have pledged to match up to $175,000 in donations for Team Vegan 2014! This is the largest matching challenge that’s ever been pledged to Team Vegan and gives us the chance to raise a full $350,000 for spreading veganism! Team Vegan is our annual spring fundraiser in which VO supporters sign up to raise money to help us bring veganism to the mainstream. Although many Team Vegan members do a run or cycling event, you don’t have to do an athletic event to take part. Your Team Vegan activity can be anything – or nothing. You can be an official team member by merely asking your friends and family to donate to your page to support a charity you care about. By joining Team Vegan, you can create the change you want to see in the world - you can help us grow. 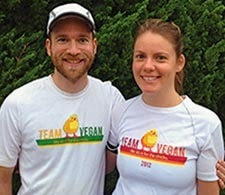 Anyone who raises $500 gets a free Team Vegan 2014 running jersey! And this just in: A generous supporter has pledged to donate $100 to every team member's page who has registered and has a profile pic up by May 20th! Click here to become a member of Team Vegan!